There are phases in our lives that are difficult as they arise, but offer the most powerful potential to change ourselves and our lives for the better. We may not be able to see it in the moment, but as we look back, we find ourselves transformed. Often though, as we are in the middle of those situations it seems as though we are sensing our way through the dark, to find the light at the end of the tunnel. It helps to have some orientation during those times. That’s why my intention is to create a little map with these 5 stages, so that the next time you find yourself in the dark, you can shed some light on the situation by remembering the stage you’re in and where it’s leading you towards. 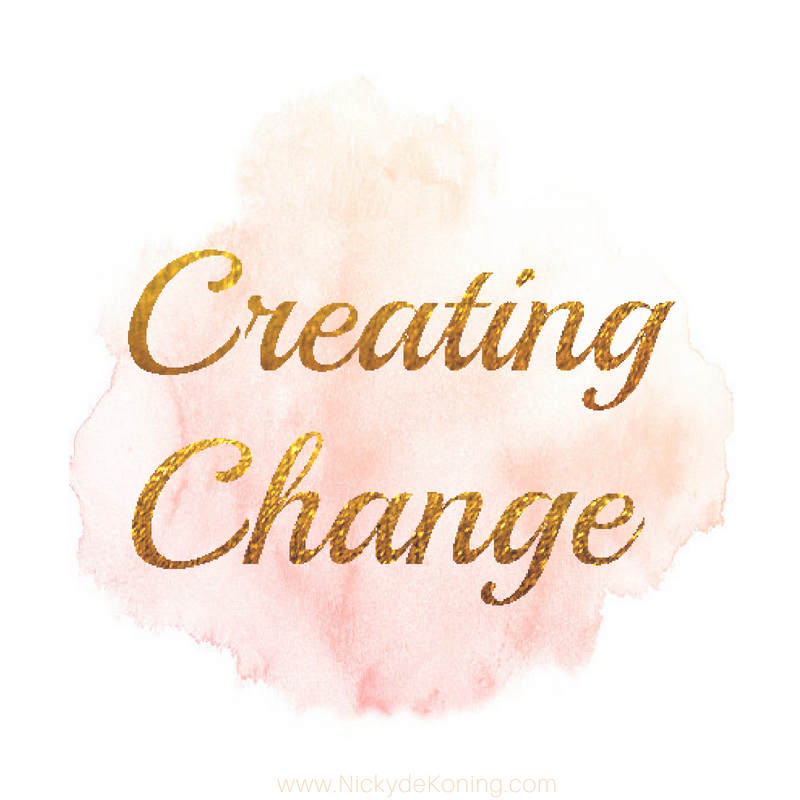 In this first stage of creating change, you will probably notice something itching inside of you. This project, person or part of your life that once meant the world to you (and that you may still love a lot) for some reason doesn’t seem to fit and flow and feel as good as it used to anymore. Some discernment is needed here, as this could also point towards the need to open up to a deeper level of connection, commitment or communication. What I am referring to here, is that moment when you realise that you have tried everything you could think of… you’ve communicated, you’ve been coached, you’ve cried your heart out and you’ve reflected, read or written pages about it. You’ve really made an effort. But the situation still hasn’t changed. Something just doesn’t sit right anymore. Perhaps the other person, or you, has changed over the course of time, perhaps your priorities have changed or perhaps all parties have learned their lessons and are now ready to move on. This is usually when you enter the next phase, when the truth slowly starts to sink in. This project, person, part of your life is indeed coming to an end. And it hurts. A lot. Tears may flow. Lots of them. And it’s actually good. Because in this phase you have the potential to heal a lot of pain, perhaps even beyond this situation and reaching as far as childhood wounds. When it comes to feeling and healing, here is a helpful blog post that goes into more detail about embracing your emotions and healing the deeper layers. Because at this stage you are going through a healing process. Goodbyes can bring grief. Whether it’s a lot or a little, a part of your heart feels shattered. Grief has its own five stages as well, which you can google en masse online. The most important part is to be there for your heart. It’s hurting. And the more you love it, the safer it will feel and the faster it will hear. So cry, slam a pillow, fill as many journal pages as you need to or book a coaching session for more support. Do all you can to get the old energy out of your system. It will hurt, but it will help to heal. At some point, there are no more tears to cry, our inner and outer space have been cleaned and cleared. This is when we slowly start to see straight again. The clouds of emotions that had covered our hearts are slowly lifting, a little bit like in the song ‘I can see clearly now’. We start seeing the situation with new eyes, we may even become hopeful that perhaps this ending was for the best and brings a new beginning indeed. In this phase of clarity, we now start to become aware of new possibilities that we couldn’t see before. We receive insights, inspirations and ideas… which lead us up to to the next phase. During the last stage, it was as though we were standing high up on a mountain, overlooking our lives and seeing the possibilities. Now in this stage we have the chance to put this new potential to practice. Will we enter this new relationship, job, collaboration or project that we’ve been playing with in our mind up until now? When we take the idea out of our mind and bring it into the world, we move from an inspired idea to initiating action, we make a commitment. When we do, we have this special magic of new beginnings, things seem to flow and we move forward with excitement and ease. Creativity, courage and creation abound at this stage. We seem to experience synchronicity and life seems to love us. Paolo Coelho calls it beginners luck in his beautiful book ‘The Alchemist’. A reward for the many tears of the last stage. At that point we can either decide to ‘never mind’ and give up, or we can choose to ‘never quit’ and do what it takes to keep going and growing. This stage holds a powerful potential for growth. Because where before we might have avoided that difficult talk, that deeper level of vulnerability or that dive of going ‘all-in’. Each commitment brings a lesson, and after we have said yes to it, we will most like be tested or tempted along the way, will we leave or will we stay? Sometimes the lesson lies in having the courage to actually leave (phase #1) and at other times, the lesson will require us to stay and move through the challenges that may arise along the way. When we decide to learn the lesson and put it into practice, we show that we are serious about our commitment on a consistent basis. The roots or our relationship to this person or project will grow deeper and deeper. This is usually when we really see the transformation that we have gone and grown through. We are at times actually grateful that this situation which we were so heart-broken about has ended, since it led us to this beautiful new phase or place in our lives. Do you recognize and relate to these 5 stages? If so, which stage are you in right now? Welcome to share in the comments below. Nicky de Koning is a Soulful Business Coach, supporting spiritual entrepreneurs to Thrive in Life and Shine Online. Originally from The Netherlands, she loves traveling the inner and outer world. Nicky's passion is to invite people to ignite their inner spark, live light and stay lit. In short, to: Thrive in Life and Shine Online.